A “MUST SEE”! 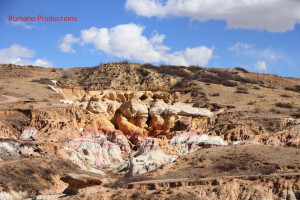 Take a short drive from Colorado Springs to the rolling hills of the Paint Mines in Calhan, Colorado for a relaxing day trip. Within a few minutes hiking along easy designated trails, colorful shapes will emerge one-by-one like a baby Grand Canyon in the Colorado prairie. 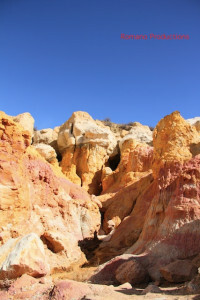 From the parking area, there’s approximately four miles of “easy” hiking trails to the Paint Mines. We allowed about two hours for our roundtrip visit and was more than enough time to see what we came for. Note: Visitors are advised to stay on the designated hiking trails at all times to protect the natural wonders of these fragile spires and hoodoos in the Paint Mines Interpretive Park. Relentless wind and water from “freeze thaw” conditions has created the spires, hoodoos and terraced layers of colorful clay and sand that you’ll see. For the past 55 million years, The Paint Mines has been a work in progress. 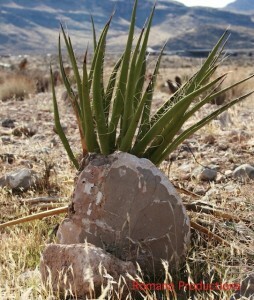 American Indians used this land for hunting as well utilizing the local clays to build pots and ceremonial paint. Directions: About 30 minutes from Colorado Springs, travel to the end of the town of Calhan via Hwy 24 and turn right on Yoder Rd and follow signs. Note: There’s restroom facilities however, bring your own water and or food. The nearest store for consumables is several miles away in Calhan. It is recommended to check the local weather forecast and dress accordingly since there are sometimes constant winds at the Paint Mines. Motor vehicles, pets and horses, alcoholic beverages and glass containers, discharge of guns as well as removing any plant, animal or rock life is strictly prohibited. View of the mountains on our way to the old mill. 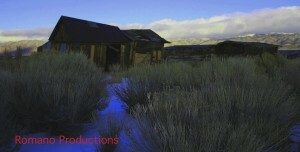 This month, I’m back in Nevada for a jaw dropping scenic tour that ultimately led to an old timber mill in the high desert. 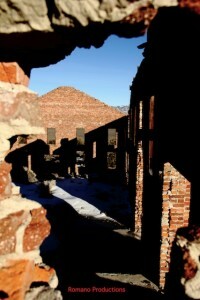 Located at 7400 foot elevation, the mill operated during the Gold Rush and supplied the town of Belmont and surrounding areas wood supplies to build homes and business and was the fuel that kept everyone warm. There’s so much to see in the desert and while it appears to be just miles and miles of sand and devoid of life, there’s lots of history here and an interesting and intriguing place. 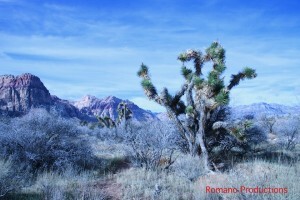 Nevada is the driest state in the United States. It is made up of mostly desert and semiarid climate regions and daytime summer temperatures sometimes may rise as high as 125 °F (52 °C) and nighttime winter temperatures may reach as low as −50 °F (−46 °C). While winters in northern Nevada are long and fairly cold, the winter season in the southern part of the state tends to be of short duration and mild. 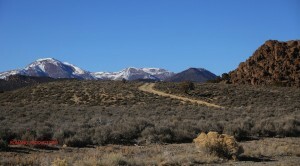 Most parts of Nevada receive scarce precipitation during the year. Most rain that falls in the state falls on the lee side (east and northeast slopes) of the Sierra Nevada. The average annual rainfall per year is about 7 inches (18 cm); the wettest parts get around 40 inches (100 cm). Nevada’s highest recorded temperature is 125 °F (52 °C) at Laughlin on June 29, 1994 and the lowest recorded temperature is −50 °F (−46 °C) at San Jacinto on January 8, 1937. Nevada’s 125 °F (52 °C) reading is the third highest temperature recorded in the US just behind Arizona’s 128 °F (53 °C) reading and California’s 134 °F (57 °C) reading. Legend has it that the Mormons named the yucca brevifolia the Joshua Tree : (from the resemblance of the tree’s greatly extended branches to Joshua’s outstretched arm as he pointed with his spear to the city of Ai (Joshua 8:18) . To see historical settlers homes still standing for nearly 150 years is amazing considering the extreme conditions in this desert region. 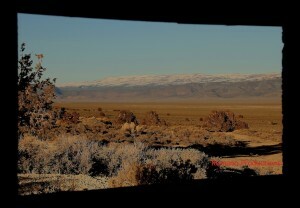 Driving along dusty and rocky back roads, there’s snow-covered mountains with small hills in the forefront. If you notice, there are hundreds of small vertical looking brown rock things. These are called hoodoos. ‘Hoodoos’ are tall skinny spires of rock that protrude from the bottom of arid basins and “broken” lands. 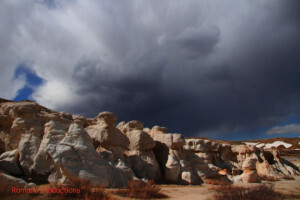 Hoodoos or Goblins as they are called are one of the most spectacular displays of erosion. They are geological formations, rocks protruding upwards from the bedrock like some mythical beings, conveying the story of hundreds and thousands of years of weather erosion. Most Hoodoos are made of sandstone, sand-sized particles cemented together by calcite, silica, or iron oxide. They are created by erosion. 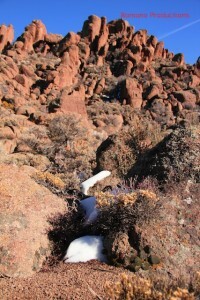 Rains, running water and strong sand winds slowly chip away the material from the bedrock. As some parts of the sandstone are stronger than others, uneven shapes of remains begin forming. Most of the time Hoodoos have a very hard rock on the top, called the Cap-rock which protects the softer sandstone layers beneath it from further erosion. That is why Hoodoos usually appear as ‘spikey’, ‘human’ looking formations ranging in size from that of a human to that of a ten story building. The old mill was still standing despite removal of all its timbers, steel lintels, wood doors and windows throughout the years. Snapping a few photos from the leeward side of the sunset as shadows cast on the backdrop of Table Top Mountain was truly a site to see. Whatever it was, the panoramic view from the old mill paints a vivid picture, that once upon a time mountains surrounding this desert valley was filled with trees and Belmont was a very prosperous wild west town to live in.